MRO & Support : Laurent Martinez (Airbus): "Skywise is a completely revolutionary approach to services"
Latest Aviation News MRO & Support LAURENT MARTINEZ (AIRBUS): "SKYWISE IS A COMPLETELY REVOLUTIONARY APPROACH TO SERVICES"
Laurent Martinez (Airbus): "Skywise is a completely revolutionary approach to services"
We met Laurent Martinez, Head of the Services business unit at Airbus during MRO Americas in Orlando in April. 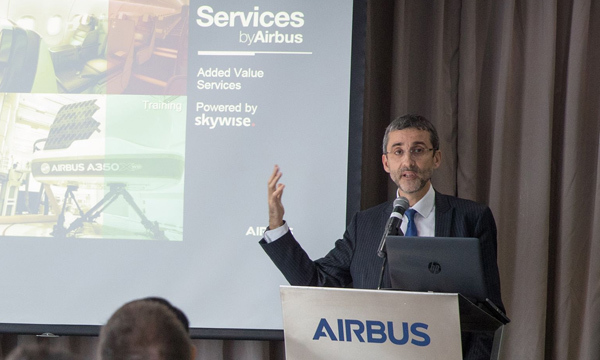 Boosted by the signature of four Skywise contracts, he looks back at this announcement and the developments he is forecasting over the coming months for Airbus, its customer airlines, its suppliers and MRO companies. You announced four new contracts for your Skywise digital services platform at MRO Americas. Are you on track with your forecasts for the number of customers and fleet volume?